Progressive Los Angeles Network, was a program by socialists, mostly affiliated with Democratic Socialists of America, to take political control of America's second largest city. The Progressive Los Angeles Network (PLAN) was formally launched in December 1999. 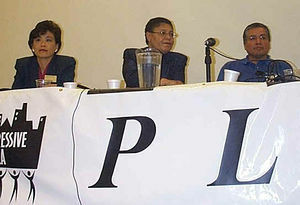 PLAN was founded and built on the success of the 1998 Progressive L.A. Conference which was co-sponsored by a number of local and national institutions and organizations including Occidental College, The Nation Institute, Liberty Hill Foundation, LA Weekly and the Los Angeles County Federation of Labor. The Progressive LA Conference "was an overwhelming success and gave participants a sense that the growth of a wide variety of progressive social movements had reached an important threshold. As a result, attendees and others within the progressive movement in Los Angeles expressed a desire to participate in further discussion about how to develop a common agenda that is community based, inclusive and brings together the wealth of experience and knowledge of organizers, activists, and researchers". In 1999, the organizers of the 1998 Conference consulted dozens of grassroots, community, labor, and environmental leaders about how to capitalize on the conference's momentum. Participants decided to develop a community-driven network that could develop a public policy agenda and action plan for Los Angeles, using the resources and knowledge of public policy experts and the experience and leadership of influential activists and organizers in Los Angeles. This network became PLAN. While PLAN evolved into less of a formal network over the years, the network members and task forces that came out of the PLAN process remained active players in areas of "social and economic justice, livability and democracy in L.A." Most recently, four PLAN members, Robert Gottlieb, Mark Vallianatos, Regina M. Freer, and Peter Dreier published a book outlining the history of the progressive movement in Los Angeles and the evolution of PLAN. In addition, PLAN participated in the development of the document "Planning for a Livable City." Progressive L.A. Conference , was convened Saturday, October 3rd, 1998 Keck Theater, Occidental College. This conference commemorates the 75th anniversary of Upton Sinclair's arrest at Liberty Hill in San Pedro, which also led to the founding of the American Civil Liberties Union of Southern California. This event serves as a celebration of the efforts by Upton Sinclair and other progressives to bridge movements and serve as a catalyst for new activities. The goals of the conference are to illustrate the role of progressives and progressive social movements in Los Angeles from the 1920s to the present and how these movements provide an alternative view of what Los Angeles has been and what it can become. Movements to be explored in terms of their contribution to this vision include the labor movement · civil rights and civil liberties movements · environmental movement · urban movements (housing, land use, transportation, etc.) · women's and gay/lesbian movements. Through this exploration, the conference will discuss the conflicts and opportunities for linking movements in order to identify lessons from the past for the future of progressive politics in Los Angeles. 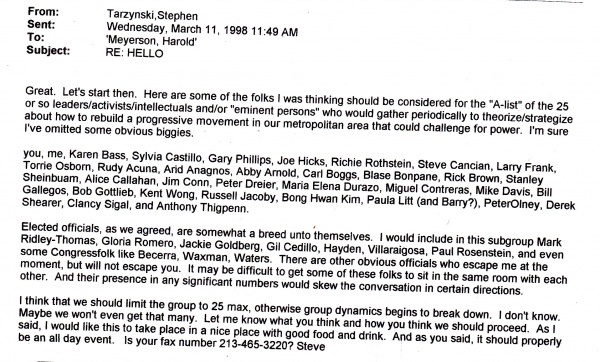 According to Harold Meyerson, writing the LA Weekly Mar 7 2001, "What has emerged over the past two and a half years is the Progressive Los Angeles Network -- PLAN, for short. With the city approaching this spring's watershed election, in which half the City Council and all three citywide elected officials are termed out of office, PLAN's plan was to hammer out a platform for a progressive Los Angeles. Over the past year, representatives of roughly 50 groups, along with some unaffiliated policy wonks, formed nine task forces to assess and make suggestions for the city's policies in such fields as housing, economic development, transportation and land use, community development, the urban environment, health policy, and democracy and participation. This Saturday, at Patriotic Hall downtown (1816 S. Figueroa St.), PLAN will present its platform -- the key recommendations of its task forces for new directions in city policy. Some of these policies have been tried in other cities, like the establishment of an affordable housing trust fund financed in part by a fee imposed on developers of large projects. Some are specific to L.A.'s environment, such as the greening of the L.A. River, and some to our political topography, such as inclusionary criteria for neighborhood councils. And some -- conditioning development on living-wage policies, establishing a municipal health-care pool for living-wage workers and employers -- would move L.A. further down the road toward a municipal minimum wage and health coverage than any other American city. Today, L.A. is poised to become a laboratory for the next century's democracy. No other major city has so polarized an economy and so dynamic a movement for social and economic equity. No other major city will play so large a role in determining the destiny of America's third great wave of immigrants. No other major city is changing so fast. In the struggles of immigrant workers for a living wage, of parents for decent schools and medical care for their kids, of families for homes, of motorists for time, of a city for air it can breathe, the American future is being born. PLAN's Progressive LA: The Next Agenda Conference was held On October 20, 2001 in Los Angeles at the California Science Center. According to PLAN activist Harold Meyerson of the LA Weekly, newly elected Mayor Antonio Villaraigosa can call on a "locally based progressive talent pool" that includes such policy activists as Occidental government professor Peter Dreier and nonprofit housing advocate Jan Breidenbach (in housing), Roxana Tynan of the Los Angeles Alliance for a New Economy (in development), Larry Frank of UCLA’s Labor Center (in work-related issues), and the Liberty Hill Foundation’s Torie Osborn (for general administrative genius). In 2013, Torie Osborn was serving as Deputy Mayor for Neighborhood and Community Services for Los Angeles Mayor Antonio Villaraigosa. The Progressive Los Angeles Network (PLAN) is a new alliance that brings progressive organizers, activists, researchers, and policy practitioners together across issues, constituencies, geography, class, race and gender to forge a common public policy agenda for the Los Angeles region. Hundreds of PLAN participants have met over the past year to develop action plans on issues ranging from transportation, the urban environment, and food and nutrition, to economic development, housing, and workers' rights. This 21 Point Agenda provides a list of priority actions that the City of Los Angeles should take to make LA a more just, livable, and democratic place. 1. Ensure public investment yields quality jobs and community benefits. 2. Gear job training towards quality jobs. 3. Consolidate all economic development functions. 4. Increase urban parks and clean up contaminated brownfields. 5. Inventory toxic health risks, and reduce pesticide use. 6. Promote clean fuel vehicles and green energy. 7. Institute a Livable City Plan. 8. Boost the Housing Trust Fund. 9. Require developers to build affordable housing units in all new residential developments. 10. Crack down on slum landlords. 11. Attract food markets, farmers' markets and community gardens to under served neighborhoods. 12. Launch an annual report, plan of action, and policy council on food, hunger, and nutrition. 14. Promote safe, walkable and bikeable neighborhoods. 15. Promote smart growth land use. 16. Promote workers' rights to organize. 17. Strengthen protections for low-wage workers. 18. Strengthen public sector union job opportunities. 19. Institute a health care fund or purchasing pool for employers. 20. Promote increased electoral participation. 21. Ensure full participation on commissions and neighborhood councils. This page was last modified on 30 June 2017, at 00:44.